FROM May 6, 2019 onwards, the Bank of Ghana will issue upgraded banknotes into circulation. “The upgraded banknotes also come with improved durability and machine readability,” it explained. It added that although the upgraded notes would feature some prominent changes, principal design elements such as the ‘Big Six’ portrait, the denominational colours, the dimensions of the various denominations and the other principal and background images would remain unchanged. The upgrade in the features of the notes comes 12 years after the cedi was redenominated in 2007 when four zeros were knocked off. 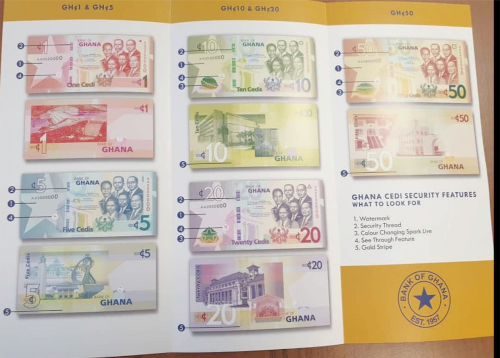 The Head of the Public Affairs Unit of BoG, Ms Esi Hammond, told the GRAPHIC BUSINESS on April 8 that the upgraded notes would cover the GH¢50, GH¢20, GH¢10, the normal GH¢5 and the GH¢1 notes. She said it would, however, not affect the GH¢2 and the other GH¢5 notes, which she said were introduced as commemorative notes. While the commemorative GH¢2 note features a portrait of Dr Kwame Nkrumah, Ghana’s first President, that of the GH¢5 features a portrait of Dr James Kwegyir Aggrey, a renowned educationist. She said the reason for upgrading the commemorative GH¢5 and GH¢2 notes was that they were introduced to commemorate special days in the nation’s history. As a result, she said “when they fade out, then they are out. If there is a need to print some, we can do that”. Ms Hammond further explained that the upgraded notes were to circulate hand-in-hand with the existing ones until the former faded out of the system completely. When asked if there was a timeline within which the ‘old notes’ would cease to become legal tender, Ms Hammond said “there is no time limit”. “They will co-circulate until the existing ones run out of the system,” she added. The BoG statement explained that the enhanced security features in the new notes would include optically variable magnetic image (SPARK LIVE), new enhanced security thread (RAPID), more prominent watermark and enhanced iridescent band at the back of the banknote. Optically variable magnetic image (SPARK LIVE): It is a shiny colour-changing image of the cowrie shell on the GH¢10, star on the GH¢20 and cocoa pod on the GH¢50. When the note is tilted, a shiny line across the cowrie shell, star and cocoa pod moves up and down. The colour of the feature also changes from gold to green when tilted.